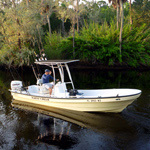 This section is for our members to talk about things not actually about fishing or boating. However, please read the Code of Conduct before posting. Keep it civil... I expect folks to be courteous and respectful on here. I understand a jab and cut now and then but the last few threads I've edited reminded me of Middleschoolers shooting spitballs. 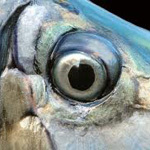 Get back to where the fish are and be nice. You got it Barry - but I will say - funny how all my remarks are remove yet SK's flippant (top put nicely) response to a question remains. Good ole' boys club at work - getting eerily similar to the Florida Sportsman Forum. 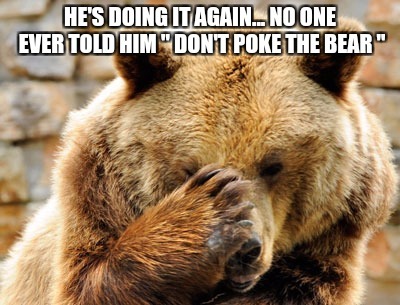 Ever heard the saying "Don't poke the bear"? Redfin wrote: Good ole' boys club at work - getting eerily similar to the Florida Sportsman Forum. Not the moderating that's making things seem eerily similar to the FS forum but instead the inability for threads to stay civil. Glad to see Bman stepping in so it can stay different than the other forum... why I like visiting this one much more than the other one, even if traffic / posting is good bit heavier on FS. Don't got a dog in this hunt but demise of FlSportsman should give warning! It may be that my sole purpose in life is simply to serve as a warning to others. Every forum has their keyboard warriors and trolls. Last edited by ropeman on January 17th, 2019, 1:36 pm, edited 1 time in total. I'm too techno challenged to know how to delete a post, but I edited the mess out of it so the original isn't on there. Thanks Ropeman, solid move. Ya'll have a good one. Last edited by Scoop Sea on January 17th, 2019, 2:48 pm, edited 1 time in total. "Be Careful Not To Confuse Motion With Progress." Last edited by rockyg on January 17th, 2019, 10:40 pm, edited 1 time in total. rockyg wrote: This whole deal started because of one dude "Redfin". Barry was too slow to moderate the guy and when he finally did he didn't ban him, just warned him and deleted a few posts. Don't blame me for others content. I didn't post that link. And ban me? For what? All the issues I've caused since 2004?? LOL. OK - I can tell you're one of those who has to to have the last word, so feel free, Im done. I never saw any offending posts, but I have read the remaining posts. Any suggestions that this Forum is descending into a pit of Hell,is making a mountain out of a molehill. A hissy fit every 10 years is about as rough as its ever been and thats forgotten after the following weekend. Time to move along, nothing to see here. I go duck hunting for a few days and you guys are at it again.